Boothwyn, PA, September 10, 2008 -- Halloween costume and accessory retailing giant, Halloween Adventure, released its highly anticipated “Hottest Costumes of the Season” list on Wednesday morning. From infants to adults, Halloween Adventure’s “Hottest Costumes of the Season” list offers something for everyone. 1. Batman: The Dark Knight -- The title character from the hottest film of the year is sure to become the hottest Halloween costume of the season due to the film’s massive popularity. 2. The Joker -- Heath Ledger’s phenomenal rendition of the Joker has fans flocking to the costume shops in droves to pay homage to the dark character and a beloved, talented actor. 3. 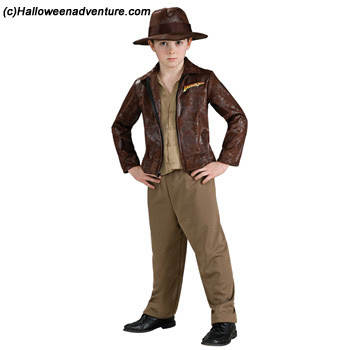 Indiana Jones -- Harrison Ford still has it after all of these years and a new generation of aspiring adventurers have found a new hero. 4. Hannah Montana -- She’s cute, trendy, and a favorite Halloween costume among young girls. 5. The Clone Wars -- Commander Cody and Leader Rex share the number five spot on the list. From infants to adults, the Clone Wars costumes, offer something for everyone this season. 6. High School Musical “Sharpay” -- Sharpay is as glamorous as any teen queen could ever be. Her beauty, style, and incredible personality thrusts her into the Halloween costume industry in a big way. 7. Ironman -- Expect to see the title character of one of Hollywood’s most popular films around every corner this Halloween. 8. The Incredible Hulk -- Bruce Banner’s alter ego is hotter than ever this season thanks to one of this summer’s hottest films. 9. Barack Obama and John McCain -- It seems as though these two political contenders will duke it out for the number nine spot before the November 4th presidential election. 10. Harry Potter -- The release of “Harry Potter and the Half-Blood Prince” may have been delayed, but that’s not stopping loyal fans from donning the robes for a magical night of adventure this season. Halloween Adventure is a division of MASQUERADE, LLC, headquartered in Boothwyn, PA. The company operates 100 Seasonal Halloween Costume Super Stores from Coast to Coast in the US, and year-round MASQUERADE, Imagination Super Stores in Philadelphia, PA, Pittsburgh, PA and the World’s Most Imaginative Costume Store spanning 3 floors at 808 Broadway and 104 4th Avenue in New York City’s East Village. HalloweenAdventure.com is an online costume superstore, selling: costumes, masks, makeup, accessories, wigs, shoes, props and more. For more information, please visit: http://www.halloweenadventure.com/.